I have been waiting for months to see An Education (2009). I mean, for starters, it is a movie totally made for me: it has a great cast, including brilliant new-comer Carey Mulligan; it is a little British gem of a movie which is like a grown up version of St. Trinians (oh, and it is so much better); and it is a love story, yet it doesn't so much focus on love as all the others do. Jenny (Mulligan) is a sixteen year old schoolgirl who goes by her days studying Latin and playing the cello-and is building up to go to Oxford University on her father's demands. But her world is turned upside down when she meets the 30-something year old David (Peter Sarsgaard), who introduces her to a life of champagne and parties, and endless amounts of money to throw away and live in luxury. 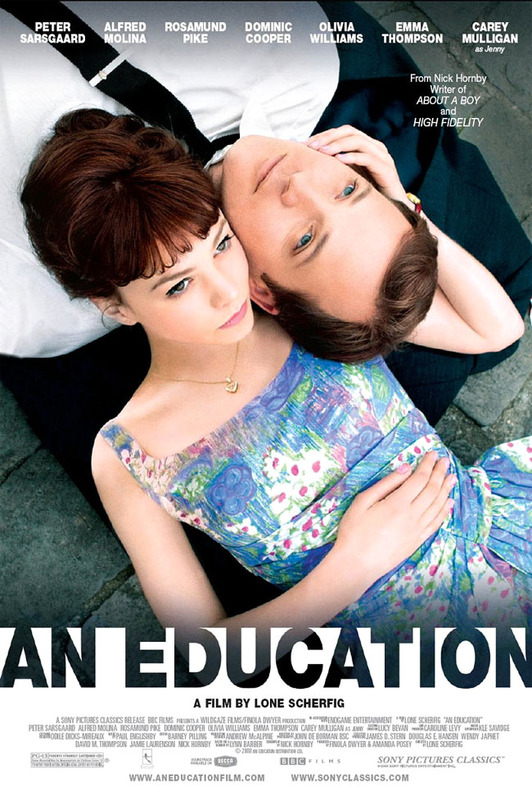 Jenny falls in love with David, but is slipping away from the reality that she is young, still in school and has to go to Oxford. Does she want Oxford or to live her life away with David in Paris? Without Carey Mulligan, this film probably would have sucked. She carries it along, and completely embodies the role of Jenny, a precocious teen who thinks she has all the answers. The Oscar nomination and BAFTA win were very well deserved. An Education is a film which is like a diamond in the rough-it is amazingly scripted, amazingly crafted, it is just amazing all over. And as for the costumes, well, the 1960's must have been a really great time to live in. This movie is dominated by Mulligan, but praise must go to her co-stars, Sarsgaard, Dominic Cooper, Alfred Molfina, Rosamund Pike, Emma Thompson and Olivia Williams. And the director Lone Scherfig along with screen-writer Nick Hornby. You have created a masterpiece. Probably more suited to those who love British films or just films in general.